Ashraf’s are practically a one stop shop for Dental Clinics in Kuwait. We have endeavored to get the best of products from across the world for our Dentists here. Ancar founded in 1958, as a family business designed to provide mechanical support to professionals interested in offering their clients maximum quality as well as the best equipment and service. Ancar’s commitment is to create lasting products of high quality and impeccable performance to cause minimal environmental impact throughout the product life cycle. Quality, durability and efficiency are concepts that have been incorporated into our design, production and recycling processes. Ancar manufactureAluminum Core body dental chairs. They maintain the priority of ensuring a balance between our activities and respect for the environment. In other words, a commitment to quality, environmental management and sustainable development principles. Our product reflects a commitment to continuous, practical and functional innovation. Our Research and Development experts apply themselves to the full when designing our dental treatment units to create work tools that adapt to the situations which arise on a daily basis at professional dental surgeries. Every detail in our units has been designed with every care and attention, always with an eye on their end use. The result is a solid, robust and long-lasting design. Exceptional aesthetics by industrial designer Ramón Benedito (winner of the 1992 National Design Award). For Ancar, the external design should favour the work of the professional and make the patient feel comfortable, creating a sense of calm, well-being and neutrality. Designed to last and provide peace of mind for professionals: details such as no joints and corners on the instrument tray favour the cleanliness and hygiene of the equipment. 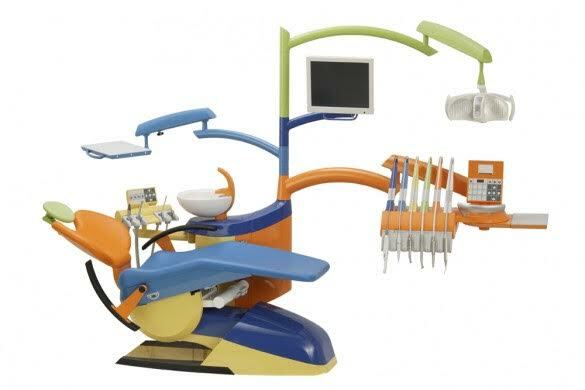 Iride International has designed and manufactured furniture lines and accessories for dentist’s practices and dental technology laboratories since 1986. But its roots are much deeper. Indeed, its founder and inventor entered the dental sector business already in the ’70s and thanks to his brilliance and patent inventiveness Mr. Enzo Tonin founded the apple of his eye, “IRIDE”.After his sudden and untimely death in 2006, his heirs and all IRIDE sta, motivated by the roots of the company and by the uniqueness of what Mr. Enzo Tonin had created still go on growing and making IRIDE grow according to values and traditions of the past and of a man who was able to see beyond. Behind iride products there are an extensive research of materials and excellent esthetic solutions. For example the beveled edge in abs or the gaskets on the ledges of all doors and drawers, which are well inserted and easy to clean. The colour matching is really nice, delicate and technological, to accompany every work you do without tiring you. The epoxy paints used guarantee homogeneity without smears also in hidden areas. A wide range of colours is available for frame, doors, drawers and handles. The company is focused on development, production and sale of dental units, dental chairs, dental instruments and handpieces, 1970 in a new production plant of Chirana Stara Tura in Piestany was successfully managed and developed, apart from other products, the first Slovak dental chair ZOK9. There where situated products primarily related to hydrotherapy, operating tables, examination beds, oxygen therapy and laboratory furniture in Chirana Piestany due to spa tradition in Piešťany, all in accordance with government decision from 1962. SOREDEX designs, manufactures and markets easy to use and innovative imaging solutions for dental and maxillofacial professionals. SOREDEX portfolio covers wide range of applications from intraoral, panoramic, cephalometric extending to large field-of-view cone beam CT for demanding ENT and CMF diagnostics. Close co-operation with imaging professionals give us deep insight of how to incorporate true diagnostic value to clinical work. Our products are known for reliability, simplified workflow and excellent image quality. We are committed to fulfill these promises today and in the future. If there is ever need for support or you would like to learn more about our products, our well-trained global distributor network is at your service. They are happy to help you to find the most suitable imaging device for your needs and offer timely after-sales support. SOREDEX is the proud developer and manufacturer of these famous brands: CRANEX®, DIGORA®, SCANORA® and MINRAY®. Martin Klarenaar and Olaf Schäfer founded the company elexxion GmbH in 1959. The actual vision was to finally bring lasers to the market thatallows dentists to offer their patients exceptionally pleasant treatments.Low-pain to pain-free treatments, preferably without a syringe, Surgery without bleeding, Improved wound healing, Pain treatments, Selective hard tissue ablation, Effective yet non-invasive periodontal- and periimplantitis therapies, Good long-term results with as few recurrences as possible in periodontology and endodontics, From the very beginning, elexxion has relied on high-performance and high-peak-power pulsed technologies.Today, we can say with pride that we belong to the world’s leading laser specialists. Dolphin Imaging & Management Solutions provides high-quality 2D/3D imaging, diagnostic, practice management, case presentation, and patient education software for dental specialty professionals worldwide. Dolphin products tightly integrate with digital x-ray units, CBCT systems, telephonic solutions and Web-enabled applications, and are compatible with the latest operating systems and computers including Intel-based Macintosh computers. The company currently supports thousands of specialty practices worldwide, and has an active academic program whereby selected products are donated to selected educational programs. Presently, hundreds of dental schools and specialty departments such as orthodontics, maxillofacial surgery, pediatric dentistry and radiology are utilizing Dolphin Imaging & Management Solutions software on a daily basis.Dolphin products are backed with round-the-clock, personalized technical support. Centaur Software Development Co. is a leading Australian provider of practice management software products and services to dental and allied health practitioners. Initially designed by Sydney Dentist Dr Frank Papadopoulos, it was established in 1992 with the aim to create practice management software products – Dental4windows SQL™ & Practice Studio™ which have over the years, evolved into the most popular and the best-selling practice management system in the industry. The system is based on the principles of a robust and powerful central database and offers a unique and dynamic solution that can grow with the needs of your clinic into full practice integration. It was specifically designed to keep your practice at the leading edge of practice management technology and links effortlessly intelligent appointment scheduling and comprehensive practice management with complete clinical functionality. Centaur Software Development Co. have invested significant resources in the systems, facilities and personnel required to provide outstanding service to its customers, assisting them in achieving maximum value from their investment in IT. The products success is due largely to the invaluable feedback from customers combined with the teams continuing commitment to provide them with the highest quality products and services to enhance their business success.Our products and services include software and related hardware, ongoing training and support, and supply of other related imaging and photography products. Both systems are designed to increase the quality and reduce the cost of providing care by allowing doctors and allied health professionals to manage their practices more efficiently and reduce the administrative burdens created by an increasingly complex general health care environment. The software relies on a proven technology incorporated in the Dental 4 Windows SQL software to meet the needs of the Allied Health market.Practice Studio Software provides a low-cost universally accessible system for a diverse user population including Physiotherapists, Naturopaths, Chiropractors, Acupuncture, Podiatrists, Psychologists, Dieticians, Speech Pathologists, Osteopaths, Psychotherapists, Homeopaths, Remedial massage, etcThe system supports full range of clinical and patient related activity, such as general practice management, treatment notes and history, scheduling and appointment management. It also takes care of all financial, administration and business management tasks including accounts, receipts, banking, practice marketing, referrals, recalls, patient correspondence, stock control and many more.Just like dental4windows, Practice Studio is totally modular and can be offered as individual components, meeting needs of various users managing a single or a multi-specialist practice operating in single or multiple locations. Saniswiss Inc. is a high-tech company established by a team of health professionals, supported by renowned microbiologists. Together, we offer new perspectives for progress and skills, intended to anticipate international healthcare trends and regulations in the field of antimicrobial and more generally in infection control.Our vocation is international, undertaking based on five totally complementary areas – the innovation, the industry, the marketing, the service and training mainly in the healthcare but not limited.Through our network of subsidiaries and authorized dealers in more than sixty countries we perpetuate the High Quality requirement of our manufactured products, valid ground of our success.Nowadays, lethal germs are certainly one of the major threats to human life in the medical environment. Cross-contamination and increasing resistance of microorganisms are forcing the need for enhanced safety and health precautions.Most disinfectants currently available on the market to combat microorganisms are themselves creating environmental problems and threats to our health and communities. Single-use products are representing pollution thanks to their toxic composition. Government organizations and scientists are obliging the industry to find safer and more ecofriendly solutions. Switzerland pioneer in this field was the first country to introduce a carbon-tax “VOC-tax” on every disinfectant containing “Volatile OrganicCompounds”.Whereas we bequeath to the future generations a polluted world and resistant germs, Saniswiss it is given for vocation to answer these new challenges since 2006. By developing innovative technologies we participate actively in this improvement by offering modern ecofriendly and healthy alternative solutions without creating new germs resistances.Think too, in the future generations by opting for the high-tech Saniswiss products. Founded in 1931, Wolf occupies a unique position in the manufacture and distribution of imaging accessories.Howard Wolf is the president and third-generation principal in this family owned-and-operated business. Mr. William P. Winters, our executive vice president, has been with the organization for over 23 years. His depth of experience and relationship with key customers has forged long-term alliances with our top channel partners. Carolyn Price, our CFO, has also been with the company for over 25 years and has been instrumental in implementing lean business practices, maximizing the resources of this enterprise.We have National Sales force that sells through our dealer network. Internationally, we have been exporting our products to dealers and OEMs since the early 1950s. We have a fully-staffed international sales department and employ salespeople throughout the world.Wolf manufactures over 180 different products in our new 65,000 square foot facility in Deer Park, New York. We currently employ over 100 people in our manufacturing and administrative facility. The latest addition to our extensive product line includes digital radiography accessories and lead protection products used in clinics and hospitals alike. Flow’s lineage is almost as long as the history of modern dentistry. Harry Wolf founded the company as Wolf X-ray in 1931. At the time its dental product portfolio was limited primarily to x-ray mounts and viewboxes. Over the years, the company expanded its service to dental professionals, increasing its manufacturing capabilities to include a wide array of high-quality, competitively priced imaging products.In the mid 1970’s, under the second generation of Wolf family ownership, the original company split into two entities: Wolf X-ray for the medical market and Flow X-ray for the dental market.With its new focus on dentistry, Flow again expanded its product line to include dental x-ray film in paper packets. In the 1980’s, the company developed a soft, flexible vinyl packet x-ray film that quickly became the second best selling film sold in the United States. Panoramic films, film positioners (including the popular RAPD system), lead protective aprons, and many more essential products later joined the Flow catalog.In recent years, Flow acquired the HDX DC X-Ray machine from the DentalEz Company and launched the EnVision DC, a next-generation digital imaging machine with many innovative features. Most recently, Flow expanded its product portfolio with a new line of Perfect Pocket X-ray Mounts; two convenient phosphor plate products, Safe’n’Sure barrier packets and the SMART Positioning System; and new Comfee’s sensor sleeves.Now under the third generation of Wolf family ownership, Flow is changing its name to Flow Dental. This signals the company’s plans to expand beyond imaging – to bring to dental professionals an even more comprehensive catalog of products, all with the same quality and reliability that they have come to expect from Flow X-Ray. Mozo-Grau was established in 1996 in Valladolid (Spain) with the aim of serving oral surgery and implantology based on the experience of great professionals to create, design, develop, and launch to the market new products and solutions for daily practice. Mozo Grau is made up of a big team of professionals, highly qualified and specialized in their fields and has departments for Quality Control, Manufacturing, R&D&i, Logistics, Customer Service, Accounts, Management, and Sales. Since its establishment, quality and customer service has been the company´s main reason for success, and the best recognition of this work are the international and national awards won. However, our main achievement is the trust of more and more clients everyday. Dexcowin Global develops and produces a complete mobile X-ray and digital solutions. We have broad film and digital X-Ray solutions for the dental, medical veterinary, inspection and security markets. Mobility and safety are built into every Dexcowin product. Our philosophy is simple. Dexcowin continues to meet and exceed our customer’s needs and wants. Leading the mobile X-ray industry in terms of mobility and safety is what Dexcowin provides. We continue to produce creative and enabling technology that maximizes customer satisfaction. Patients enjoy the mobility and the instant imaging of the Dexcowin digital X-ray process. Doctors enjoy highly effective and economical imaging tools that assist them throughout the diagnosis, treatment and planning process. ASA Dental S.p.A. is an industry-leading manufacturer of instruments for dentistry, surgery and dental laboratories, based in Italy. We provide a broad range of products including Diagnostic, Periodontal, Surgical, Restorative, Orthodontic and Disposables. Our products are sold to some 5,000 dental distributors in over 50 countries. To provide best of class dental instruments and customer service at competitive prices. Asa Dental was originally founded in 1964 as a trading company. Ten years later we established our first production site in Maniago near Venice and began manufacturing dental instruments. In 1980 we started producing Saliva Ejectors from a new factory in Marlia near Lucca. In 2001 we acquired Derby Dental, a French manufacturer specializing in hand operated instruments since 1927. In 2004 we acquired KaltoPlast, the Swedish company which first launched Saliva Ejectors, and established ourselves as the world leading manufacturer for Aspirators. The company’s headquarters are in Bozzano near Lucca. Our production facilities in Italy (Maniago and Marlia). Silfradent is based in one of the main industrial areas in Northern Italy, in the middle of a charming National Park at the border between Romagna and Tuscany. Since 1975 Silfradent has specialised in the production of instruments for prosthetic laboratories. During these years Silfradent research laboratory has proposed numerous solutions to improve working conditions of prosthodontists. Today Silfradent has a complete range of products including, among the others, valued and resistant micromotors, very accurate isoparallelometers, modular sanders, powerful steam generators and reliable mixers. All our instruments are designed and manufactured in compliance with European directives and comply with CE specifications. Teka dental is Italian manufacturer of high quality dental burs.